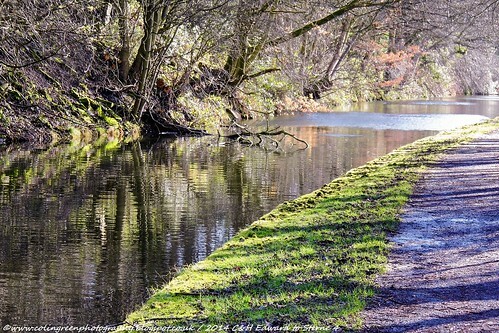 Colin Green Photography: Edwards Road to Sterne Mills Bridge along the Calder & Hebble Navigation. Edwards Road to Sterne Mills is a collection of 19 pictures taken along the Calder & Hebble Navigation Canal. Edwards Road bridge is approx. 1 miles from Sowerby Bridge Wharf with a distance to Sterne Mills Bridge of 2.75 furlongs (0.34 miles). The land alongside the canal path is undergoing development in to a housing estate having previously been waste ground from the former wire works that had stood there. There are 15 pictures available to view on Flickr with some featured here as well as an additional 4 exclusive to Clickasnap via the links below. Taken from the Copley Side of Edwards Road Bridge looking west. I took this in October 2017 using a Nikon d3300 SLR camera. The Calder & Hebble Navigation between Bridges 4 and 5. Taken on February 1st 2014 on the stretch of canal between the bridges using a Polaroid iS2132 bridge camera. The Calder & Hebble Navigation. Taken using a Polaroid iS2132 bridge camera looking west along the canal between the bridges. After the Bend, Sterne Mills Bridge. Taken using a Nikon d3300 SLR camera facing towards Sterne Mills Bridge. Each link opens in another window and any views of over 5 - 10 seconds help support my photography and blog. The following pictures are taken from the Flickr album. Taken on January 17th 2016 using a Nikon d3300 SLR camera looking west along the canal. Taken using a Polaroid iS2132 bridge camera on the 1st February 2014 looking east along the canal. Taken using a Nikon d3300 on the 17th January 2016. The water flows in to the canal alongside Edwards Road Bridge. Taken on October 16th 2016 using a Nikon d3300 SLR camera. Looking east along the canal. All the remaining pictures can be seen on Flickr and Clickasnap. The World's largest, free to use, paid per view, image sharing platform. Stylish and unique wall art for sale. You can help to support my blog and photography by donating below.